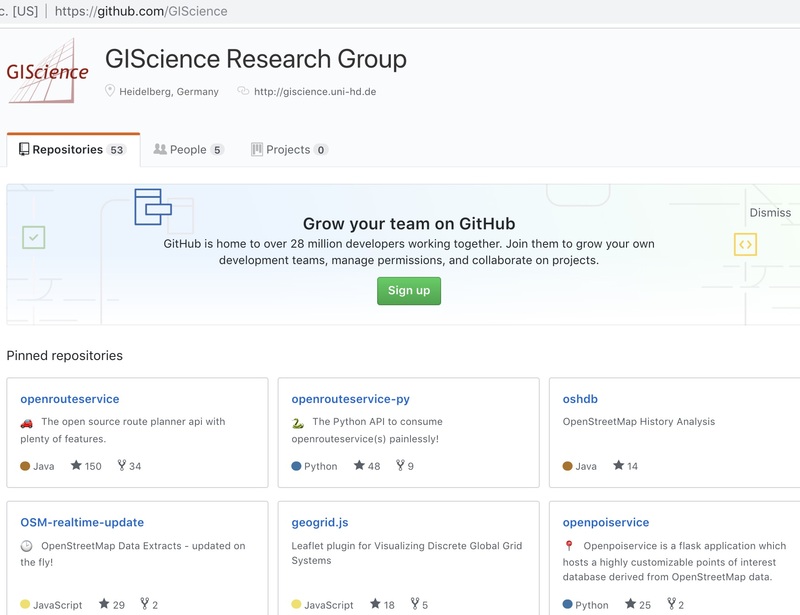 The GIScience Research Group at Heidelberg University and the Heidelberg Institute for Geoinformation Technology (HeiGIT) are happy to share the their GIScience github repository contains now already over 50 open source repositories and it’s still growing. These contain results from several research projects and in particular also some very active long term activities. Most of the tools and services are related to OpenStreetMap and related Volunteered Geographic Information (VGI) sources, but also 3D geodata e.g. the Heidelberg LiDAR Operations Simulator Helios, the Voxel Octree Solar Toolkit Vostok, the 3D WebGIS framework GIScene.js etc. Another major activity is related to intrinsic OSM quality measures, mostly based on analysing the history and metadata of OSM (including the osm wiki). This includes several active projects, such as ohsome, oshdb, osm-measures, osm-vis, osmatrix, iOSManalyzer, etc. Several other repositories are related to supporting humanitarian organizations like MissingMaps (RedCross, Doctors Without Borders, etc.) and HOTOSM with tools for improving and analysing crowdsourced geographic information, e.g. MapSwipe analytics, the HOT critical number tool, osm-analytics, or also the Realtime OSM service, that is needed for updating the openrouteservice for disaster management. There are also some more generic (e.g. libraries for discrete global grid Systems: geogrid) or even more special tools (incline from osm gps tracks) you may want to explore on your own… Have fun!